This is recipe came from Our Best Bites and was a perfect summer time dish...and it has been feeling like summer around here already :-). I loved it and I loved the leftovers the next day for lunch. I'll definitely be making this again and again over the next few months! Place chicken in a zip-lock bag with the juice of one lemon, a couple tablespoons of olive oil, and a couple tablespoons of red wine vinegar. Smoosh around and set bag aside while you get your other things ready. Put the pot on the stove to boil water for the pasta. While you're waiting for the water to boil, slice the zucchini in half length-wise. Drizzle with olive oil and sprinkle with salt and pepper. Press, or finely mince garlic cloves. In a small sauce pan on the stove, place 1/4 C olive oil and add garlic. Turn burner onto low-med heat. It shouldn't be popping and frying, it should just slowly warm, infusing the oil with the garlic and removing that zing fresh garlic has. When water boils, add pasta and a spoonful of salt. Remove chicken from bag and salt and pepper both sides. Place chicken, and zucchini on grill. While chicken and zucchini are grilling and pasta is boiling, chop herbs and get out cheese. Zest both lemons and juice the one that hasn't been juiced. When everything is done cooking mix it all together. 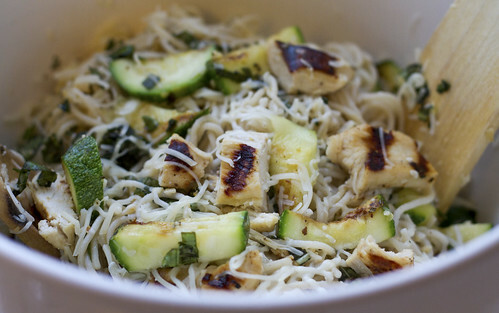 When zucchini and chicken are done take them off the grill and chop them up. Drain pasta and immediately place in a big bowl. Place chopped zuch and chicken on top. Add lemon zest, lemon juice, cheese, herbs, and garlic-olive oil mixture. Now take some tongs and give everything a big toss. If you feel it needs more moisture, add a little of the pasta water, or a little more olive oil. This will make 4 generous servings. Garnish with a little more Parmesan on top and another squeeze of lemon if you have any left. 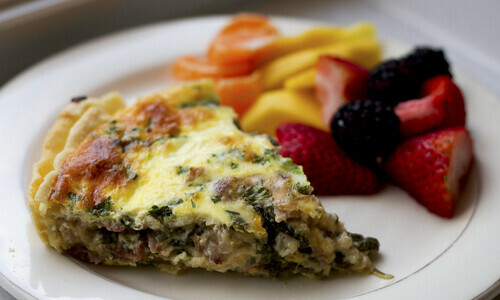 This yummy quiche recipe is from Dish Delish. Mike was definitely skeptical when I told him we were having quiche for dinner (and that's all! ), but this one is super filling and delicious. 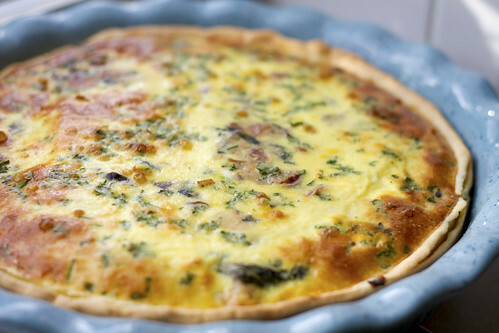 The recipe also makes 2 quiches, which is perfect if you need to take a meal to a friend in need, for a brunch, or any other large gathering (and if not, just cut it all in half!). Preheat oven to 375 degrees. Brown bacon, drain, crumble, and set aside. Saute spinach in bacon drippings. Drain. Saute onions. Add mushrooms. Stir in ham and bacon. Combine spinach, sour cream, salt, and pepper. Add meat mixture. Mix in cheese. Divide into each pie crust. Mix eggs, half and half, and parsley. Pour over pies. Place pies in oven and bake 45-50 minutes or until tops are puffed and golden brown. Let stand 5-10 minutes. Each pie serves 8. I found this rice recipe on Cassie Craves and it was super flavorful! I even halved the amount of sour cream and cheese, trying to lighten it up a little bit, and we still loved it! 1. In a large pot, bring the rice and chicken broth to a boil. Reduce heat to low, cover, and simmer 20 minutes (because I used Minute Rice, I decreased the simmering time to about 10 minutes). 2. Preheat oven to 350 degrees. Lightly grease a 1-1/2 quart casserole dish. 3. In the pot with the cooked rice, mix the sour cream, green chile peppers, 1 cup cheese, corn, and cilantro. Season with salt and pepper. Transfer to the prepared casserole dish, and top with remaining cheese. 4. Bake uncovered 30 minutes in the preheated oven, until cheese is bubbly and lightly browned. This is another recipe I found in an old issue of Cooking Light. I made them for lunch when my sister was over and they were super yummy. The combination of the sweet peaches and the slight spice from the pepper jack was perfect! 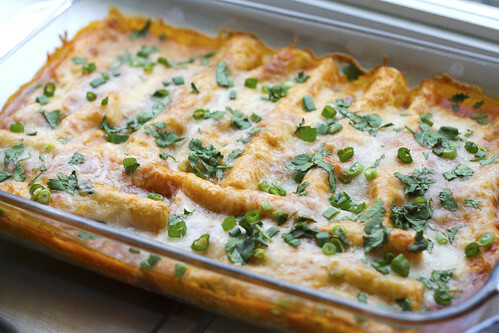 This is a great way to use up some left over chicken (and the sour cream sauce is especially good)! 1. Combine honey and lime juice in a small bowl, stirring well with a whisk. Stir sour cream into honey mixture; cover and chill until ready to serve. 2. Place tortillas flat on a work surface. Sprinkle 3 tablespoons cheese over half of each tortilla; top each tortilla with 1/4 cup chicken, 1/4 cup peaches, and 1 teaspoon cilantro. Fold tortillas in half. 3. Heat a large nonstick skillet over medium-high heat. Coat pan with cooking spray. 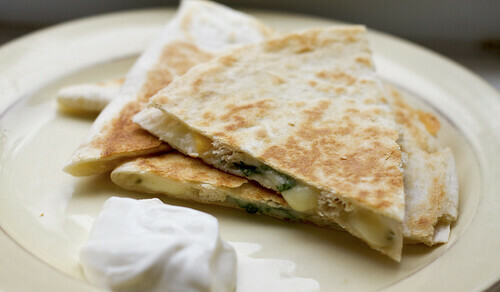 Place 2 quesadillas in the pan, and top quesadillas with a cast-iron or other heavy skillet. Cook 1 1/2 minutes on each side or until tortillas are crisp and lightly browned (leave cast-iron skillet on quesadillas as they cook). Remove quesadillas from pan; set aside, and keep warm. Repeat procedure with the remaining quesadillas. Cut each quesadilla into wedges. Serve with sauce. This recipe is from the Dec 2010 issue of Cooking Light and was simple and flavorful. I think it would be really great with a little sour cream inside it too. I love meals like this because you can personalize each burrito so everyone is happy! 1. Bring first 6 ingredients to a boil in a small saucepan. Stir in shredded chicken and green onions. 2. Combine beans and salsa. 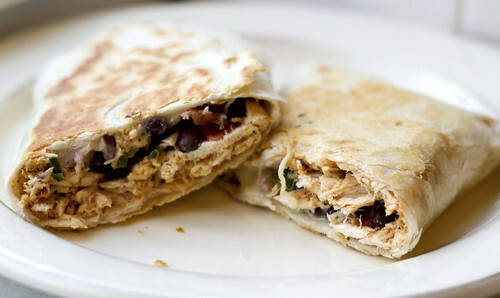 Spoon 1/4 cup bean mixture and 1/2 cup chicken mixture down center of each tortilla; sprinkle with 2 tablespoons cheese. Roll up. 3. Heat a large skillet over medium-high heat. Coat pan with cooking spray. Add 2 burritos. 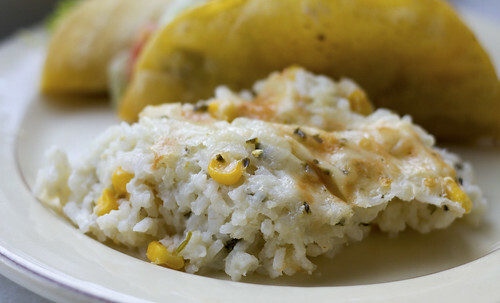 Place a cast-iron or other heavy skillet on top of burritos, and cook for 3 minutes on each side. Remove from pan, and repeat procedure with the remaining 2 burritos. I like to throw a more traditional dinner in the mix every so often, one that is guaranteed to be loved and when I saw this one in a recent Parade insert I knew the whole family would love it. I was right...they did :-)! 1. Drain tomato juice from cans and reserve liquid. Put tomatoes into a food processor or blender; pulse 1 or 2 times until chunky. Simmer, covered, in a large pot. 2. Chop onion. Saute, using enough olive oil to coast the bottom of the skillet, over medium-low heat until translucent. Mince garlic and add to the onion. 3. Put sauteed onions and garlic into tomato pot. 7. 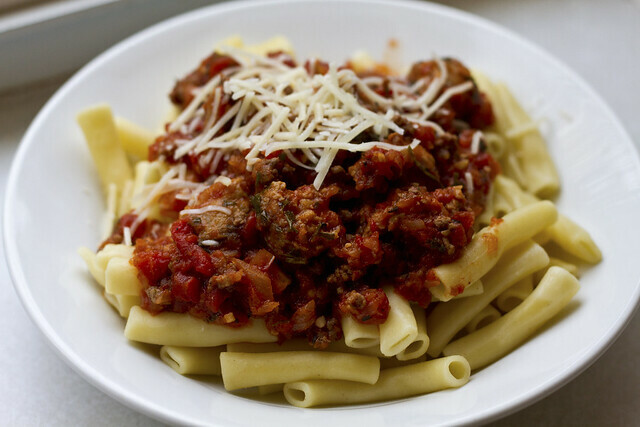 Spoon pasta into bowls with sauce. Add a dollop of ricotta cheese and sprinkle of parmesan, to taste. Finish with fresh basil. 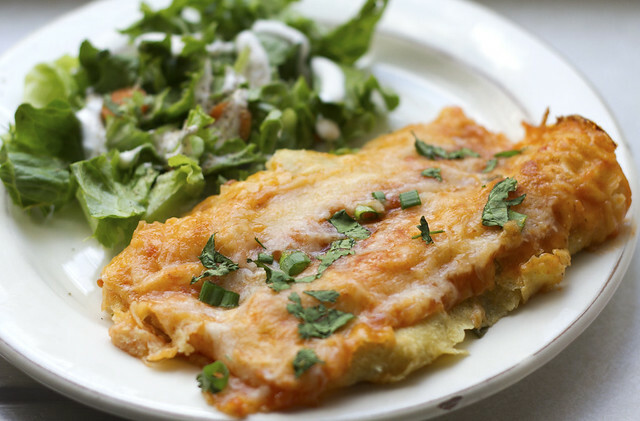 I'm always up for a meatless meal that looks really tasty and filling and when I saw these enchiladas on Peachtree Cooking I was definitely intrigued. After making them I wasn't sure if I would really like them in the end, but with each bite I loved them more and more. Soon I was raving about them and even Mike gave them a thumbs up (and that says A LOT about a meatless dish!). Even little Preston ate them up and wanted more. They are definitely worth a try even if you usually don't go the meatless route! 1. Make sauce in medium sauce pan. Heat oil, add 1 tsp. cumin, flour, and tomato paste. Cook, whisking 1 minute. Whisk in broth and 3/4 cup water. Bring to a boil. Reduce to a simmer and cook until slightly thickened--5-8 min., salt & pepper. Set aside. 2. Make filling in a large bowl. Combine 2 cups cheese, beans, corn, spinach, half of green onions, 1 tsp. cumin, salt & pepper. 3. Pre-heat oven to 400. Lightly oil baking dishes. Set aside. Stack tortillas and wrap in damp paper towels. Microwave on high 1 minute. Top each tortilla with 1/3 cup filling. 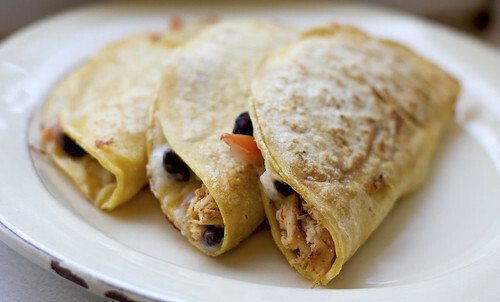 Roll up tightly and arrange in pans (I used one 9x13 pan and saved the extra filling for quesadillas the next day). Pour sauce over and sprinkle with 1 cup cheese. 4. Bake uncovered until hot and bubbly, 15-20 minutes. Cool 5 min. Garnish with green onions. The picture I took of this soup really didn't do it justice and I was afraid you wouldn't try this AMAZING soup as a result, so I didn't risk it :-)! I made this soup for some girlfriends for lunch this week and then our family had the leftovers for dinner that night and everyone LOVED it! In fact I printed out copies of the recipe for my 2 girlfriends because they wanted to make it for their dinner that very night too. 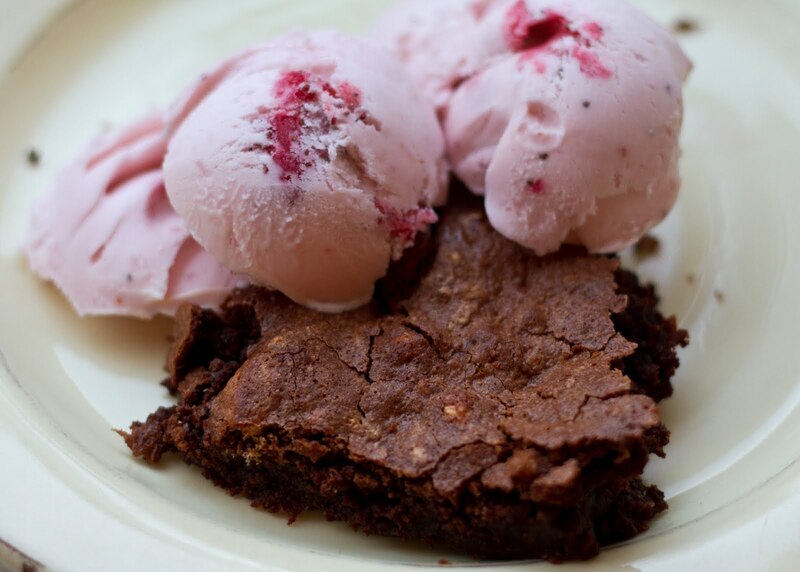 The combinations of flavors is perfection and the recipe makes enough to share! Saute the onion and shredded carrots in the butter in a large pot. Add flour and curry and cook five more minutes. Stir in the chicken broth and bring to a boil. Reduce to a simmer for about 30 minutes. While simmering, cook the chicken pieces in a fry pan. Add chicken, apple, rice, raisins, thyme, salt, and pepper to the soup. Simmer for 20 more minutes until the rice is done. When there is about 2 minutes left, stir in the cream. This recipe was in the Parade magazine insert of the Sunday paper a few weeks ago and is from Ingrid Michaelson. I ripped it out thinking it would perfect for our Valentine's dinner dessert and my grandma saved it for me too since it was gluten-free. Although my cake didn't turn out very pretty (and we tried our best to follow the recipe...maybe I didn't beat the egg whites enough?! ), it was DELICIOUS!!! 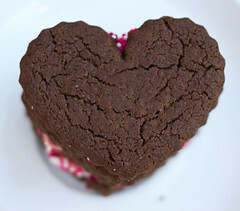 It was better than any gluten filled brownie I've tried (shhh, don't tell). And I plan on perfecting this baby by making it again and again! We had it with this equally tasty strawberry ice cream to be a little more festive. 1. Preheat oven to 300 degrees. Melt chocolate and butter in a double broiler. Stir together half the sugar and four yolks; add to melted chocolate concoction. 2. Using an electric mixer, beat the egg whites; slowly add remaining 1/2 c sugar until stiff peaks form. Fold mixture into chocolate. 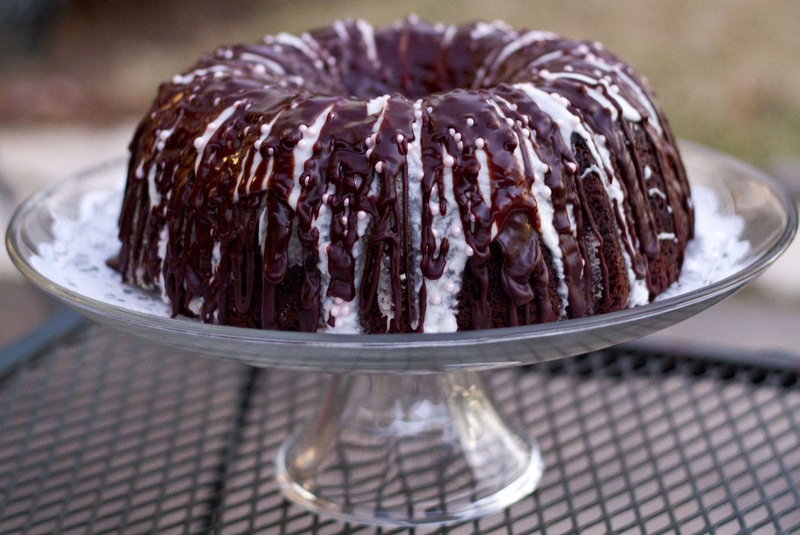 Pour into a greased 9-inch cake pan. 3. Bake 40 minutes, or until a toothpick inserted in center comes out with just a few crumbs on it. Cool 30 minutes before removing from pan. Dust with powdered sugar. This SUPER yummy stir fry recipe is from Kill the Gluten. (I wish they were still posting recipes on their blog, but I still have quite a few left to try.) Even Mike raved about the great flavor of this stir fry and I loved it so much I never got tired of the leftovers, eating it for a couple days after. This is a definite new favorite! Mix all sauce ingredients with a whisk. Set aside. Heat 1 Tbsp sesame oil in large skillet over high heat, being careful not to let burn. Add chicken, ginger, and garlic. Saute for a few minutes until the chicken is no longer pink. Add onion, peppers, and carrots, sauteing for another minute or two. 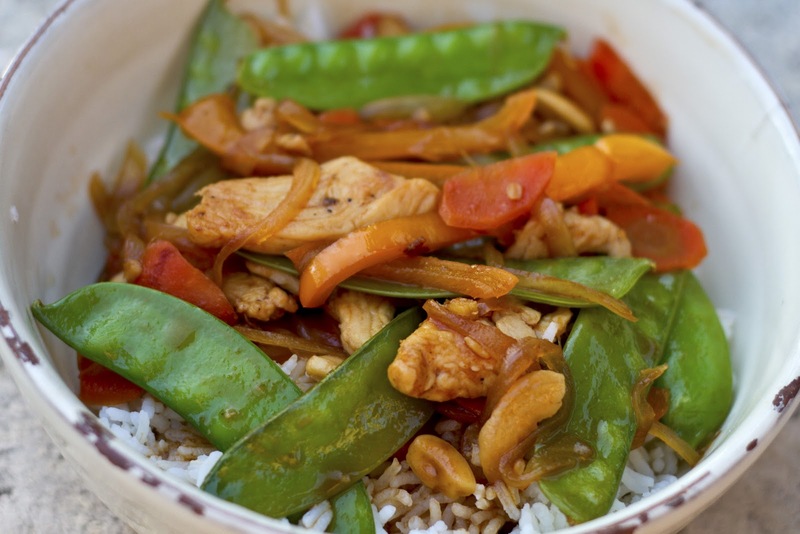 When vegetables are crisp-tender, add snow peas, cashews and sauce. Let simmer for 1-2 minutes. Serve hot over rice. *Take one bunch of asparagus and lay them out on a foil lined baking sheet. 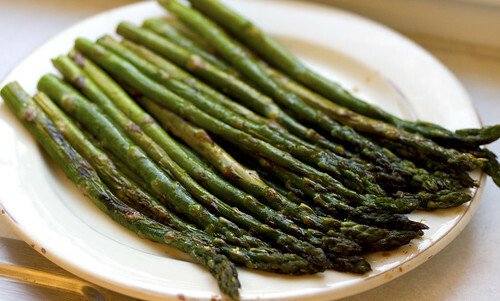 *Drizzle with olive oil and soy sauce (approx 1-2 T of each depending on the amount of asparagus). *Sprinkle generously with freshly ground pepper and sparingly with kosher salt. *Roast in oven for 7 minutes, stir them around a little bit and then bake 3 more minutes. Seriously SOOOO good! I could eat the whole pan by myself, I LOVE it! I am behind on posting my recipes, but I did want to be sure to get this one up because it would be a yummy Valentine's dessert. My mom got the recipe from one of her good friends and made it for my sister's birthday dinner last week. It was SOOOO good (my favorite bites had the melty chocolate chips inside! ), especially served warm with ice cream on the side! Grease and flour a 12 cup bunt pan and preheat oven to 350 degrees. Combine cake mix and pudding mix. Blend in oil, water, eggs, sour cream. Stir in chocolate chips. Pour into pan. Cool 10 min, then slide knife around edges of pan and invert. Melt 1/3 c margarine and stir in 2 cups powdered sugar. Blend in 1/2 t. vanilla. *my mom's friend sometimes just heats up a tub of frosting from the store and pours over the top instead. I saw these in All You magazine and they were too cute to resist! 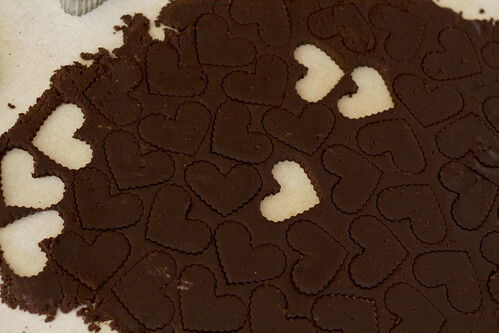 In the magazine they were circles, but we used a small heart cookie cutter to make them even more festive. My dough was pretty crumbly, but they turned out still thank goodness and got rave reviews from everyone who tried them! 2. Transfer dough to a well-floured work surface and knead briefly, then press into a small rectangle. Cut dough in half. Working with one piece at a time, roll dough to 1/4-inch thickness. Using a 1 1/2-inch round cutter, cut circles. Gather up scraps, reroll and cut as many cookies as possible. Transfer them to baking sheets. 3. Bake cookies for 6 minutes, then rotate pans (top to bottom and front to back) and bake 6 minutes longer. Remove baking sheets from oven and place on wire racks for a few minutes to cool before transferring cookies to racks to cool completely. Repeat with remaining dough. 4. Make filling: In a large bowl, using an electric mixer on high speed, beat butter until light and fluffy. Reduce the speed to low and gradually add salt and confectioners' sugar. (I added a little bit of milk to help it cream together) Add food coloring, drop by drop, until filling takes on desired pink hue. Transfer filling to a pastry bag. 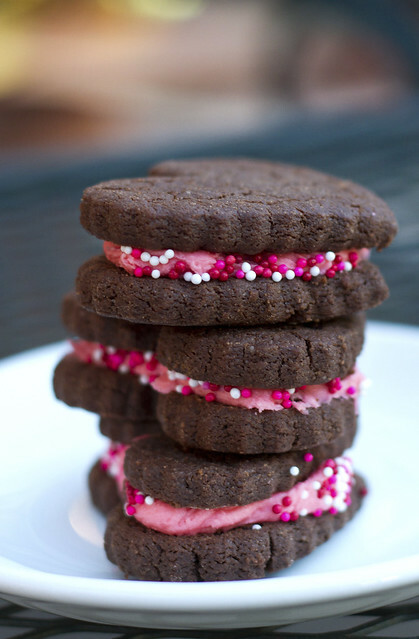 Pipe filling onto half the cookies, then sandwich them together with remaining cookies. I'll be back on track next week with my cooking and menu planning, but this week I just needed a break :-)! Here are some yummy treats in the mean time though. Then let sit 10 minutes. Mix 8-9 minutes on high. Raise 45 minutes. Roll out dough in a rectangle. Spread melted butter on dough. Spread on dough. 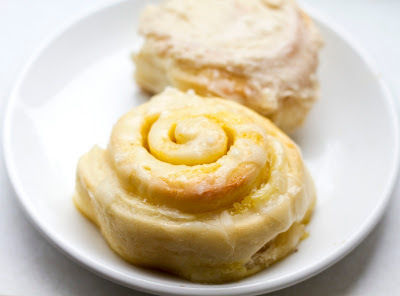 Roll dough up and cut into individual cinnamon rolls (use thread or dental floss, slip under the roll, pull up at sides, cross and pull down to make nice clean cuts). Place on cookie sheet. Let raise 30 minutes. Bake at 375 degrees for 13-15 minutes or until light brown. Top with glaze or caramel frosting (recipes below). Stir together. Put glaze on cinnamon rolls while hot. On low heat melt butter, add brown sugar. Boil 2 minutes stirring constantly. Add milk and bring to a boil. Cool to luke warm. Using a mixer, add powdered sugar (enough for consistency of frosting) and vanilla. Frost cinnamon rolls when cooled. Spread on dough. Roll dough up and cut into individual cinnamon rolls (use thread or dental floss, slip under the roll, pull up at sides, cross and pull down to make nice clean cuts). Place on cookie sheet. Let raise 30 minutes. Bake at 400 degrees 13-15 minutes or until light brown. Top with glaze (recipe below). Stir together. Put glaze on orange rolls while hot.